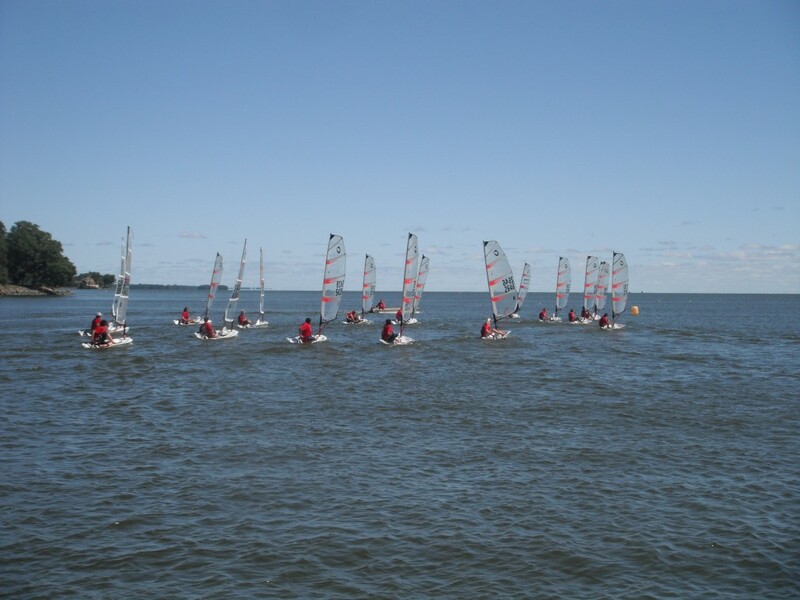 The 2012 O”Pen Bic North Americans was blessed with wind and great weather. Families came from as far as Miami to visit the Mid-west and let their kids sail on beautiful Lake Winnebago. Sheboygan, Lake Geneva, Madison, Fond du lac and Oshkosh Youth Sailing Schools sent young aspiring sailors to the biggest Un-Regatta in the Mid-West. What is an Un-Regatta? First it is a FUN Regatta with a capital FUN. Yes there is serious racing but the biggest award goes to the sailor who shows the most stoke for sailing and just has fun. 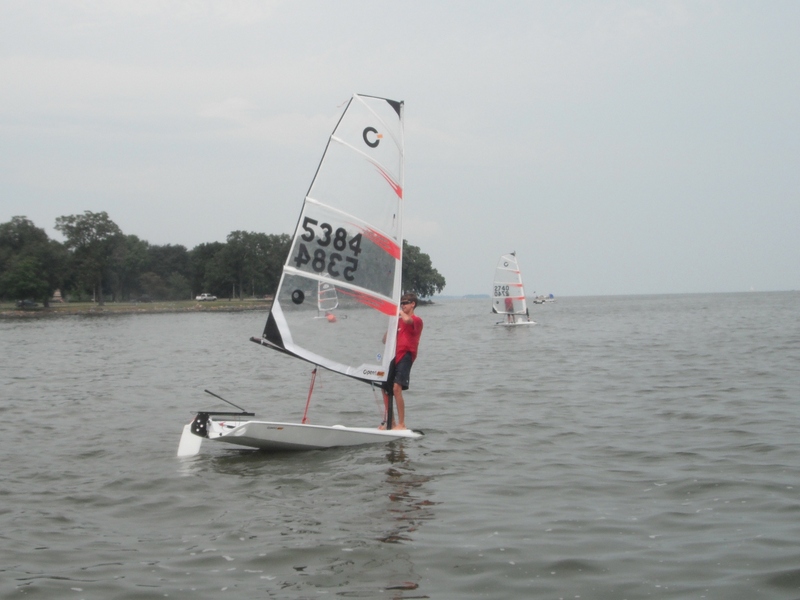 There is also Freestyle where the kids are judged on tricks they can do on the fast and nimble O’Pen Bic Youth Sailboat. These tricks most often end with them splashing in the water. The Kids team up for this event and they make up goofy names for their teams, like The Founding Fathers, The Vanilla Milkshakes or the Big Hairs to name a few. One of the best features of the O’Pen Bic is the easy that the boat can be righted and sail away after a capsize. And Kids love to capsize! Steve and Sara Eliasen were the organizers of the event with assistance from Wind Power Windsurfing & Kiting the local O’Pen Bic dealer and coach for the Fond du lac School. O’Pen Bic sent Nevin Sayre a world class sailor and Windsurfer from New England to run the racing and freestyle format. Nevin has a great gift with kids and they were all fortunate to meet him and enjoy the weekend with all the fun things he conjures for the kids to do with their boats. He keeps the pack together by making the leaders do 360’s or capsize on purpose so the others can keep up, He also has them stand up while sailing, do wheelies, 360’s, capsize and the new thing is hand stands with their feet on the boom. That that is some serious fun! The kids were divided into 2 divisions: the International Division and the Olympic Division. The Olympic Division was composed of newer sailors who were new to regattas and didn’t have a lot of time or experience in the O’Pen Bic boat. The goal was to get them involved and on the water so they could learn and increase their comfort level in this great sport. They sailed a shorter and simpler course. The International Division was composed of sailors who had experience in Un-Regattas or were comfortable racing the boat. This division was comprised of two classes” the Open and the Young Guns (under 12). They raced on varied courses with up to 9 buoys to round. Both classes started together which made great competition. On Saturday 3 races were held with a short lunch break. Followed with more racing. An incoming thunderstorm brought most of the boats to the beach while a few were used for the Freestyle Event which was right in front of the beach. Many thanks to all of the parents and volunteers who helped get the boats and everything else put away before the rain hit. Sunday had great wind with flat water early in the morning for the 10 o’clock start. The racers in the International Division were treated to a fast and furious down wind slalom course. Nevin was out there coaching and encouraging the kids while positioning the event photographer for some great photos. The first races was a mass chaos with boats capsizing every-wheres. By the third races the kids were getting it and capsizing was few and far between. The Olympic Division did some great races close to shore and the kids were looking like they were ready to move to the International Division. Their last race before freestyle was a long distance race lead by Steve Eliasen and Ian House. 5 races were held before the kids came exhausted to the beach for lunch. They all had big smiles and were ready for the Freestyle Finals. The Founding Fathers, a 3 person team comprised of Owen, Nathan and Frankie prevailed to be the overall winners of Freestyle closely followed by the Vanilla Milkshakes comprised of Tyler and Cedric. Many thanks to all of the great volunteers who were so vital to make it happen. And to the Miami families for traveling so far and also helping with the beach scene. Wind Power goes to the Strictly Sail Show at the Navy Pier in Chicago! Come and Join the Fun in the Sun and Play on the Water! Friday Morning at 11:00 sharp the crossing starts from Roosevelt County Park (Wind Power) to a destination determined that morning. Wind direction, strength and the forecast as well as sailors input results in the course for the Crossing. West wind is the best for a full Crossing the length of Winnebago (28 miles). Years past we had perfect conditions and a number of us made it to High Cliff State Park. Niles Book (The Crazy Iron man who crossed Lake Michigan solo with NO CHASE BOAT) was the only one to sail back. I only know 2 others whom have sailed the length of the Lake and back. Bet you can’t guess who! Last year was again perfect conditions with the wind blowing in the 30’s and more further out on the Lake. Everybody rigged TOO BIG and what a disappointment that not one Windsurfer made it. I was disappointed with myself because I also under estimated the wind and after sailing a few miles of the 28 miles to High Cliff, I turned around because I knew from experience it wasn’t going to get any easier up the lake. It would have been miles of ugly survival sailing, not fun. 5 local Kiters made the grueling journey to High Cliff. Hopefully this year mother nature will gives another chance. Saturday and Sunday is the 26th Annual Wind Power Championships! Mark Greinert and myself hosted our first Regatta ever, not really thinking it would still be going on almost 3 decades later. Big Lake Winnebago and the access of Roosevelt County Park just across the street from Wind Power is an excellent venue to run BIG Regattas. 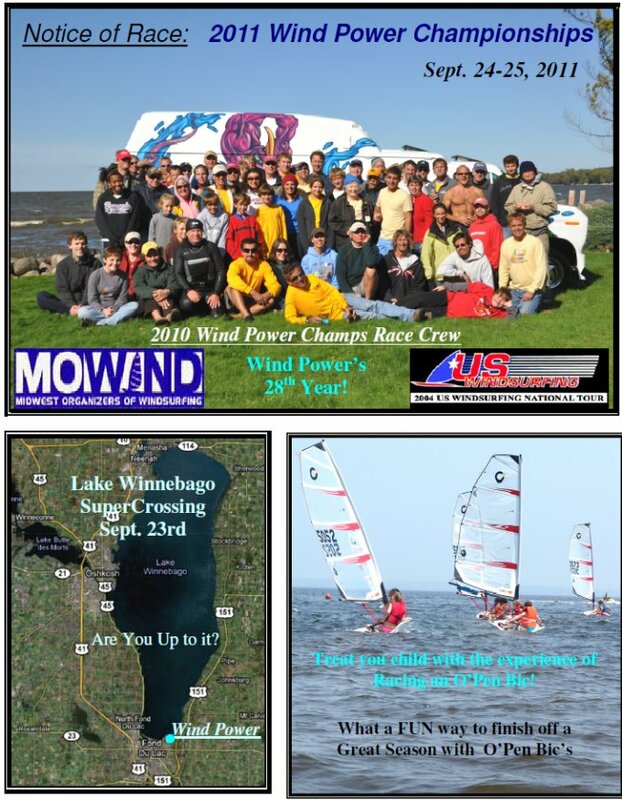 Last year 53 racers enjoyed great times on Windy Winnebago. Everyone was sore and tired after 10 races. The O’Pen Bic is a new Youth sailboat by Bic. www.O’Pen Bic.com Fleets are quickly growing in the Fox Valley area and all across the country. Wind Power has been supporting the O’Pen Bic movement and teaching many kids for 3 years. (this year over 350 kids learned how to sail with the O’Pen Bic) With all the kids sailing and racing a new youth sailboat, that is fun to capsize and do Freestyle on (Bailing is Cancelled), Wind Power felt it was appropriate to add their Fleet to our End of the Year Regatta. SO please welcome the kids who have learned to love our great sport of sailing. Let’s Keep the Wind Power Championships on the MoWind Calendar! After organizing Regattas for 26 years with the help of Family and Many Friends, I have decided all I want to do is be the PRO or Principle Race Officer. This entails getting the necessary equipment ready to run a Windsurfing race. Working with the Race Committee setting up the Schedule, Fleets and Classes, Courses and finally the Rules for the Event. I have all the necessary equipment to run a world class regatta but no longer have the desire to organize the whole event. Such as Promotions, planning the dinner, writing the notice of race and press releases, getting prizes and trophies, selecting a t-shirt and design. I have struggled through those task and many many times with the excellent help of others, But I no longer want to be the one in charge of doing them. I am retiring from those duties after this years event. I am hoping that a team will take over those duties and have fun doing it, so the Event will continue. Or someone else might want to start their own new Event on this weekend. I am sad to think this may be the end of a great Era, but I don’t have the energies needed to organize a whole event and still make it fun for me. It’s time for new blood. Check out the Wind Power Weather Center! If you haven’t been on the Wind Power Weather Center, it’s a must see. Version 2.0 will be installed this week. The new version 2.0 of the weather Center tracks history better and provides more in depth Wind Sock data. The Wind Sock rating has been tweaked to be more accurate to marginal conditions. The Wind Sock summary is awesome telling us how many days we had in a month or a year of the various wind socks. There is much more , so go to the new Weather Center and check out the Updates & Issues. We are constantly striving to make the weather Center more user friendly while providing the information and history everyone is looking for. We installed a new Wind Sensor (the Pro model) and the wind data we are collecting is more accurate to the real conditions. Use the wind history to your advantage. After a good day sailing or kiting at one of the launches, look up the wind history for the day. Take notes of the size sail or kite for the wind strength at the time you were out. Use this valuable information in the future to know what size sail or kite you should ride. The Weather Center is dedicated after Stella Blue, the developer’s beloved yellow Lab. Stella loved the water and riding windsurf boards as much as we do. She was an Icon on the beach. Click here to check out the Wind Power Weather Center. Looking forward to seeing, Sailing and just hanging out with everyone soon! Have you blown the dust off you soft water sailing equipment? Well it’s time. 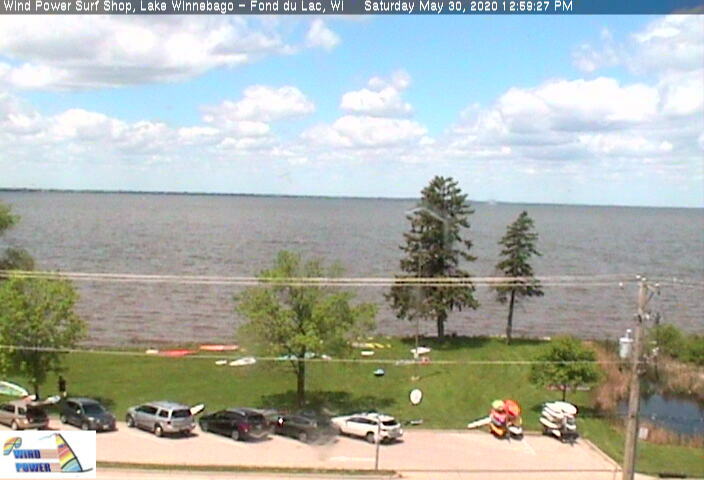 Lake Winnebago opened on April 7th, as far as we could see to the north from Wind Power . The water temps are in the upper 50’s already. A few more warm days and you can put the drysuits away. Spring is a great time for those with experience to get out and enjoy some high wind action. Be sure to check all you cold weather gear so it’s going to protect you as designed. Don’t forget to also check over your equipment; u-joint, lines, all screws. Breakdowns can quickly become a much bigger problem with colder water temps. Wind Power enjoyed it’s annual spring trip to Hatteras. A great group of 14 enjoyed warm temps in the 70’s and lots of wind. I windsurfed overpowered on my 4.2 and kited with an 8m. Christy, Pat and Greg, new kiters, worked on getting rides on soft water and Debbie learned how to Windsurf. Wind Power’s Online Store has been busy this spring and new items are being added daily. 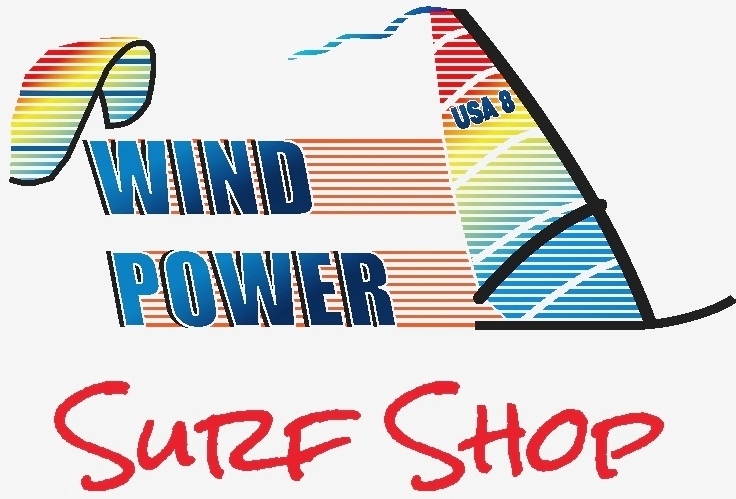 Check it out at http://www.windpowerwindsurfing.com/shop/ The Mid-West largest used inventory and replacement parts will soon be showcased in the online store! The road construction on Winnebago Drive (in front of the shop) is completed and it’s a big improvement to the area. Come and enjoy a sail out of Roosevelt County Park. Wednesday night will be the Advanced Windsurf classes. This program covers all levels, from those who have just learned to the aspiring racer. If you are nervous and not real comfortable out in the water, this is the class for you. Kevin will get you relaxed and having fun while learning how to windsurf better. Class curriculum is adjusted to the students level and the wind conditions of the day. Kiting Lessons are available, Wind Power supplies the equipment if you don’t have it. A large Pontoon boat is the launch site and a Jet-ski is the chase vehicle. Contact Wind Power for more information and to setup a time. 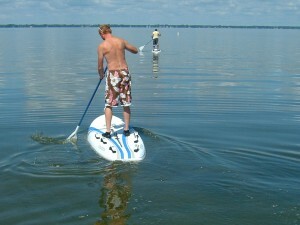 Stand Up Paddling (SUP) Lessons and equipment are also available. If the wind dies stop over to the shop and pick up a paddle. Paddling along the shore checking out the houses is interesting, you can paddle back in the channel behind Wind Power or cruise up to the Light House and even go in Supply’s marsh. Increase your Summer Fun with Wind Power! The 2nd Annual Wind Power Open Bic un-Regatta was held August 21-22, 2010 and was a big success. The images below are from the recent event. 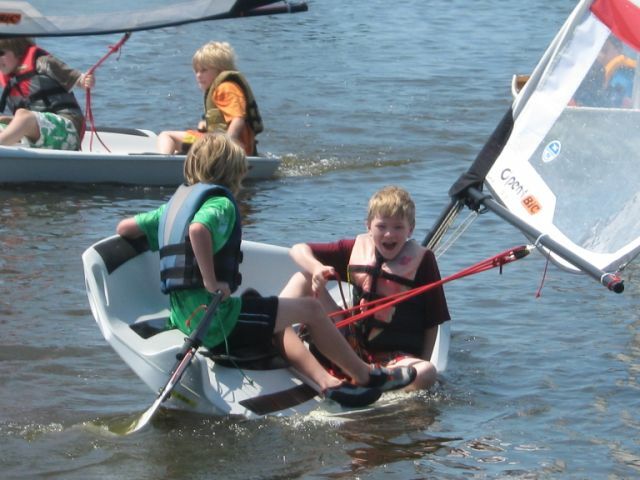 The 2nd Annual Open Bic un-Regatta for Kids will be held Saturday & Sunday August 21-22, 2010 at Roosevelt County Park across from Wind Power Windsurfing & Kiting Center, Fond du Lac, WI. The Event is for Kids and their families and is FREE!. Open Bic charter boats are available, but register early. You can see the Official Notice of Event here. Wind Power hopes to see you there. If you have any inquires, you can contact us via e-mail or by phone at 920-251-1002. Wind Power Championships 2009 Notice of Race! This is the 24th Anniversary of this fall windsurfing event. It is on the US Windsurfing National Race Tour and a MoWind (Mid-West Organizers of Windsurfing) Event. Don’t let all the hype fool you though, it’s a great event for all. Even First Time Racers! 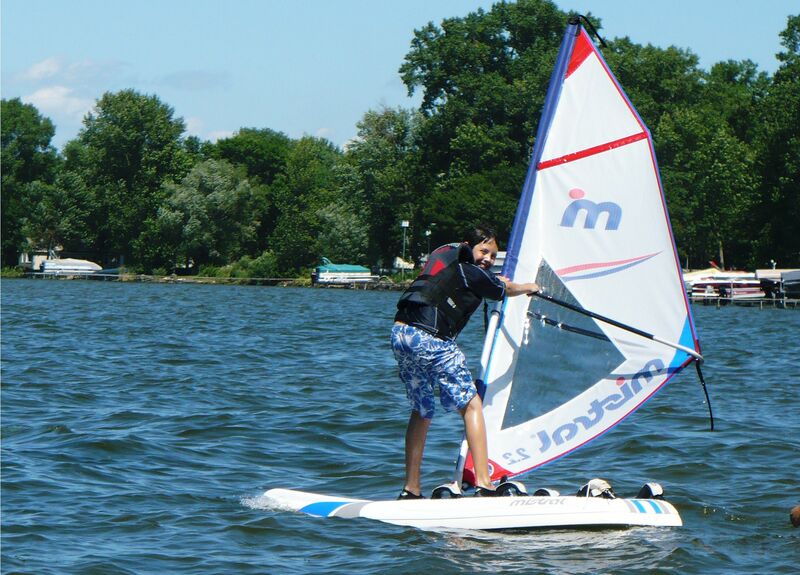 Wind Power caters to the beginner and novice racer. We try our best to make them comfortable, educate them and make them feel part of the Windsurfing Racing Family. Course and Slalom and Long Distance Racing will be offered, wind permitting. New this year is the addition of the O’Pen Bic Kid’s Sailboat Class. Click on the blue link and see a detailed description of the boat and it’s uses and the 1st Annaul Event. Wind Power held the 1st annual O’pen Bic un-Regatta Aug 22nd. With 22 racers it was a great success even though it was chilly and very windy in the morning. By noon the sun was out and the wind subsided some to offer perfect conditions for all the kids. The kids and parents unamiosly voted to make next years a 2 day event. Wind Power will have boats available for kids to race in the Championships. 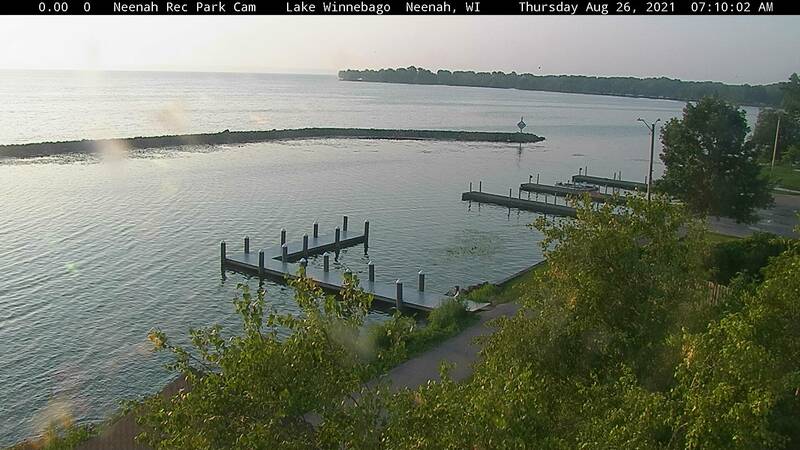 Saturday afternoon the Winnebago Association of Kiters (WAK) will host a brat & hamburger sale. Saturday night a meal and drink are provided at the Sunset Supper Club located next to the race site. At the meal the 2009 year end MoWind Awards will be presented. A bonfire at Wind Power will follow. Don’t forget to bring your Tent! Free camping in Wind Power’s backyard. Sunday starts with a 9:30 skippers meeting followed with racing. Sunday afternoon will be awards, prizes and sub sandwiches. Bring your friends and family and watch or be a part of the 2009 Wind Power Championships. Cool with light SSW winds. See the Weather Center for all the Live Observations. Sunny Summer at Wind Power!